ANN ARBOR, Mich. — Amy Olson crossed paths with her coach, Ron Stockton, on her walk to the 18th tee at the Volvik Championship. "Make it another even $20," Stockton said. 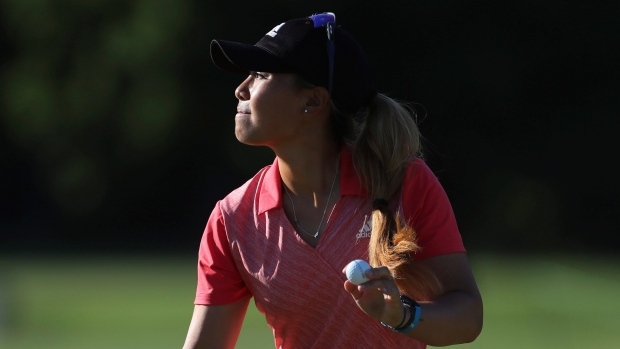 Olson closed the first round with a 6-under 66, putting her into the lead she ended up sharing later Thursday with Moriya Jutanugarn , Caroline Masson and Danielle Kang. "Absolutely," said Olson, who graduated from North Dakota State with an accounting degree. "He'll tell you I'm a little bit of a hustler there." Ariya Jutanugarn, the Kingsmill Championship winner last week in Virginia, opened with a 69. Brittany Marchand is the top Canadian after opening with a 2-under 70. Maude-Aimee Leblanc (72) and Anne-Catharine Tanguay (73) are well off the lead. The Jutanugarn sisters are Korda are among six players with a chance to become the LPGA Tour's first two-time winner this year. Moriya Jutanugarn won for the first time in six years on the circuit last month in Los Angeles. "What I feel is more relaxed now," she said. "And, of course I like looking forward for my next one." Olson, meanwhile, is hoping to extend the LPGA Tour's streak of having a new winner in each of its 12 tournaments this year. She knows how to win. It just has been a while since it has happened. Olson set an NCAA record with 20 wins, breaking the mark set by LPGA Hall of Famer Juli Inkster, but has struggled to have much success since turning pro in 2013. She has not finished best finish was a tie for seventh and that was four years ago. She was in contention to win the ANA Inspiration two months ago, but an even-par 72 dropped her into a tie for ninth place. If the North Dakota player wins the Volvik Championship, she will earn a spot in the U.S. Open at Shoal Creek in Alabama. If Olson finishes second or lower in the 144-player field, she will enjoy an off week with her husband, Grant, who coaches linebackers at Indiana State. "I'll make the best of it either way," she said. Olson was at her best in the opening round on the front nine, closing it with four birdies in a six-hole stretch. Her ball rolled just enough to slowly drop in the cup for birdie on the par-3, 184-yard 13th. She had three birdies in five-hole stretch on the back, nearly making her second hole-in-one of the year at the par-3, 180-yard 16th. A short putt gave her a two-stroke lead, but it was cut to one after pulling and misreading a 6-foot putt to bogey the 17th. Even if she doesn't hold on to win the tournament, Olson is on pace to have her best year on the LPGA Tour. She is No. 39 on the money list after finishing 97th, 119th, 81st and 80th in her first four years. "Two years ago, I started working with Ron Stockton and whenever you make a change, it doesn't show up right away," Olson said. "That first year was tough, but we've turned a corner and I've just found a lot of consistency in the last year. And, it's a lot of fun to go out there and play golf a little more stress free." Stockton helped her stay relaxed, walking along the ropes during her morning round. "Maybe some people feel a little more pressure when their coach is there," she said. "I'm like, 'Great. If he sees the mistake, he knows what can go wrong and we can go fix it.' So, I like having his eyes on me."